The finest quality chrome steel produced in accordance with the highest industry standards. These high precision G25 ball bearings are hot forged from bar stock. Modern furnaces with precisely controlled atmospheres and temperatures are used for heat treating to assure uniform hardness and proper microstructure for each stainless steel ball. Throughout the manufacturing process, statistical process control assures tolerance accuracy, fine surface finish and consistent high quality. 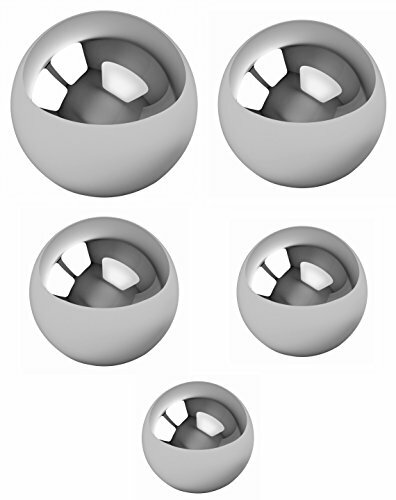 Chrome steel balls offer the precise geometry and fine surface finish that makes them especially useful for bicycles, casters, drawer slides, door locks and many other applications. 100 balls each of the following sizes: 1/8", 5/32", 3/16" 7/32" & 1/4"